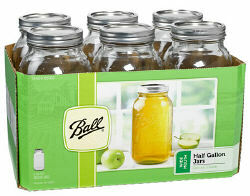 Glass jars specially designed and heat-treated for use in home canning. Ideal for fresh preserving apple and grape juices. Ball's famous glass jars and closures go beyond fresh preserving to help you with serving, creative décor, and gift-giving. Lids and bands are interchangeable with Ball or Kerr mason jars. These jars are not suitable for freezing.